First of all and most importantly, THE CAT CAME BACK. Looking full-bellied, content and not at all sure why we were making such a big fuss over his return. Phew. All are sleeping easier now. So of course, it takes a week just to get the phone turned on at your new house, between the hours of 8am and 5pm. And then, when a few hours after being on, the dialtone becomes a deafening buzz, it takes another week to get someone to return to your house, between the hours of 8am and 5pm, to fix it. And then, when the nice man fixes it and you hook up your DSL equipment, it takes four calls to techincal support where you get disconnected three times before you finally get on the phone with someone you can barely understand, who then decides that they need to send someone to your house….in a week….between the hours of 8am and 10pm. I feel like I’ve been on house arrest–waiting for the phone man, the gas man, the technical support man, the electric man. In one sense, you know, it’s okay. Because really, there’s plenty of work for me to do at home. And a little house arrest isn’t always such a bad thing. But you know, I really need a garbage can for my trash because when you live in the country you can’t just put it out by the shed. And I really need a gallon or two of milk and something to put on the grill tonight besides zucchini (thank you, dear farmers that bring bags of zucchini to my husband at work, for keeping us fed). And the girls are itching for more library books. But Monday is the magic day. The technical support man will arrive and I’ll find out if DSL is even possible in my little ‘new’ old house. I want to come back to the land of blogging. I miss you all. I have things I want to tell you and things I want to write down in this little space so that I don’t forget them. And I want to be able to check the weather radar to look for storms. Because the girlies and I love to watch for summer storms so that they can get good and scared before they arrive. And look up a recipe I can’t find. And google “safe tick removal”. In the meantime, I’m trying to bring a few quiet, normal moments back in to our day. 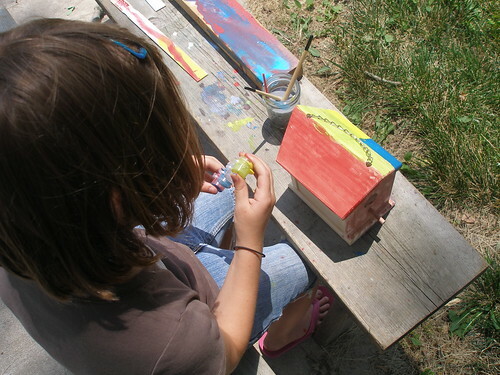 Painting a wooden bird house–that gets checked hourly for residents. Putting out a big jar of sun tea. 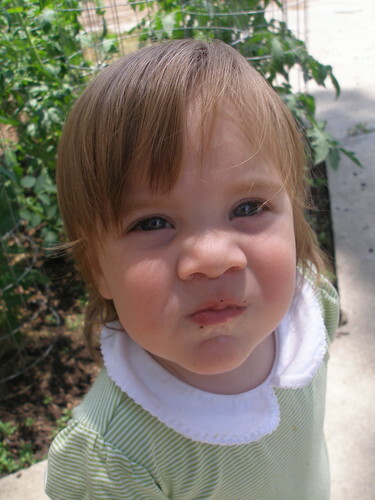 Killing time in the backyard under a shade tree and removing all bits of nastiness from a curious one year old’s mouth…rocks, sticks, grass, rocks, rocks, and…should I even tell you this? Dried up, flattened, crusty worm carcasses. (more than one.) Tell me she’ll have a great immune system when she gets older, from all these germs she’s tasting??? Now, at least, when I walk over to her, she takes them out of her mouth and hands them to me. “mum-mum? mum-mum?” Thanks, babe. Alright. Once again, it’s friday night and I feel like I’m the last one in the office. But that’s how it goes when you’re stealing an internet signal wherever you can get it…. i invested in tick removal devices and they are awesome. check it out. Oh those first few weeks in a new place are so exhausting, but then soon enough you can’t even remember them. The only safe tick removal I know is to have them removed and then move to the city:) I hope you get all hooked up soon; can’t wait to hear about everything! phew – panic over! Silly boy running away from home like that. There was probably a girl involved, girl cats are a bad influence. Ticks – yuk. My old cat used to get them all the time, we used to use tweezers, well, my mum did, I just used to make vomity noises. I had one on me once. bleurgh. 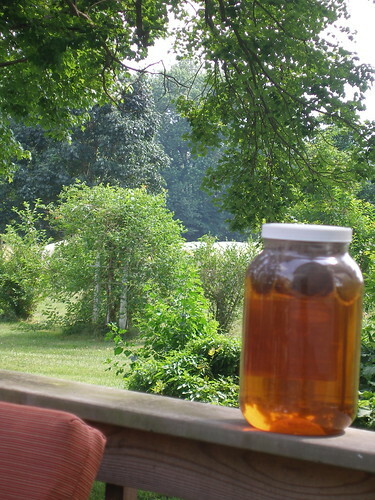 what is sun tea? I am most confused…I have had tea with milk, tea without, tea with lemon, iced tea, cold tea when I have forgotten to drink it, run out of tea and had to have coffee…sun tea is a new one for me…. I am glad the cat came back. I am sure he had lots of mice and things to eat while he was gone. I don’t think worm guts ever hurt anyone but yuck. She looks just like Mary in that photo. You always think the hard part is moving all your junk but know, then you have to wait for all those men who reek of cigarettes to come flip a switch or turn a knob. I’ve heard the ticks are bad this year and our experience seems to confirm that. glad the cat came back! it sounds like you guys are settling in – i hope your phone woes are over soon.and worms….there are worse things! Quick minute. Tick removal–drown him in rubbing alcohol, wait til he stops squirming, grab him at the skin entry point, pull gently. Learned it from a country girl friend of mine. Works much better and doesn’t yank out a huge chunk of skin–like I did earlier this season. I’m giggling about the worms. At least it’s not something else! Worms are, ah, protein! We almost moved into a house (3000 square feet, two stories, big old four square) that only had a single phone jack. That doesn’t work for me!! That was one of the reasons we DIDN’T move into that house.Looking forward to seeing what you do with your new home! You should be able to find one or the other at a vet’s office (at least, that’s where I found mine) or pet store. I know what you mean about the service people – I was trapped at home 3 times this week waiting for someone to come “between 9 and 3”. just dab on some eucalyptus oil to kill them dead, or just tweezer them out , then dab with the e oil or lavender oil. i have removed several lately. Congratulations! Can’t wait to see more pictures. I’m so happy for you! What a great surprise to find a new post on the weekend!So glad your kitty came home, and my sympathies on your waiting around on all those worker men, but what a blessing to be doing it IN your new house, which looks wonderful by the way, I’m loving that view from the deck and it’s been too long since we had our own jug of sun tea…thanks for the reminder!Finally, those worms are giving me a really big giggle, but that baby girl, my goodness she is getting so big and gorgeous!Happy weekend to you! hey, I feel like I’ve found an old friend! I found your site on the Driggers site, and as soon as I saw your daughter I knew it was you! What a cutie!I’m Hannah’s aunt, and you visited my home when we lived near Hilton Head many moons ago, back in your college days.So good to see you all growd up so good! I’m glad your move went on without too much of a hitch-I, too, have been waiting for the driveway man and internet man to come between the hours of 8 and 5 housebound!! Moving can be such a pain on so many levels. You’re doing splendidly. 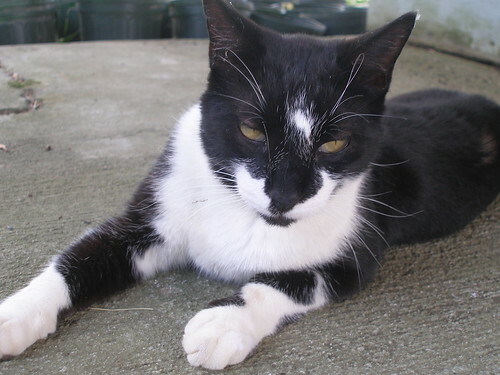 The Cat Came Back song is now stuck in my head as well…glad he came back. ;-)Your post is lovely..worm carcasses and all. Dried worms, ah yes. I can’t remember now the things my kid’s have put in their mouths but yes it will make them strong-like-bull. Happy settling. Hope that you are up and online soon, but it seems like you are having a lovely time. Apart from the waiting. This is all very exciting. Can’t wait to read more about the new house! oh you just reminded me! both my girls loved the cat food bowls (the cats are fed outside and sorry to say, but their bowls are pretty grungy). if i couldnt find a kid, i would find them squat over the bowl with fists of dry cat food in hand and mouth. my youngest stepson would eat sand at the park or beach. yikes! sweet memories now though. Can’t wait to have you back and hear all your stories. I hope you get dsl soon 🙂 It sounds like a very busy few weeks you have had lately! Next Next post: Would you read a post whose only picture is of a whole in the ground?